And it wasn’t just inmates that got into the giving mood. 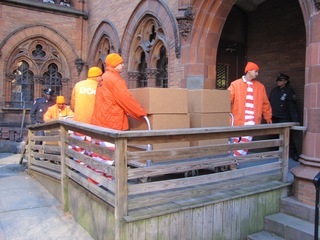 Corrections Officers loaded and delivered truckloads full of food to relief centers in the city. They also used the islands buses to move around evacuees in Staten Island and Brooklyn. 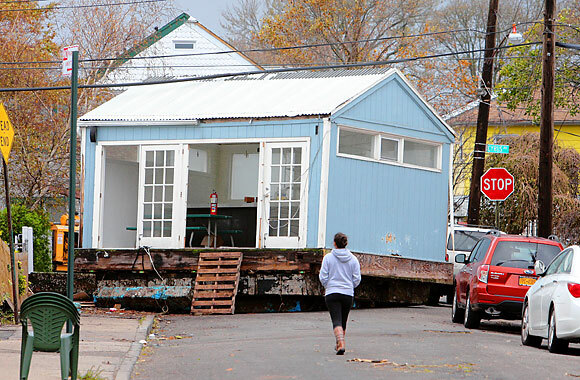 The Gerritsen Beach section of Brooklyn was one of the worst hit by Sandy, more than 2,500 homes lost power, and hundreds are still without electricity. But thanks to some big hearted electricians – and an $85,000 donation from the Brooklyn Recovery Fund – about 50 ‘High priority’ homes will get their power back this Saturday. That means homes with old people, single mothers (what about single fathers!?!) with small children, and the disabled will no longer be in the dark. Despite a post storm electrical equipment shortage, NYDN says, 20 electricians will go around installing panel boxes and circuit breakers for free (ConEd rules demand all homes be inspected by licensed electricians before they can get the power on). Weed has had some good publicity the past couple of weeks. And now comes more good green news. The Huffington Post spoke with a Brooklyn bud dealer who says he donated half of his $1,400, post Sandy profits to help victims of the Hurricane. Aww. But don’t expect him to go around relieving stress and pain by giving away the Mary Jane. “Look, there are probably some people down there [in the Rockaways] who want some marijuana — but that’s not going to clothe and feed them” he told Huffpo. 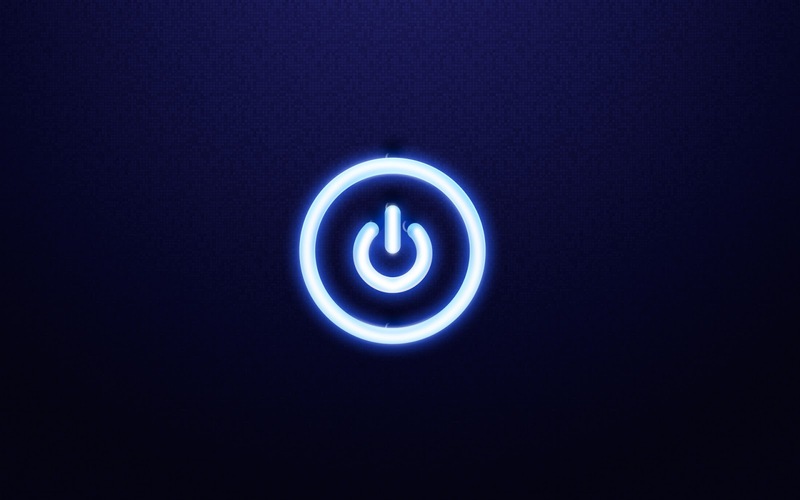 The most profitable company in all the land is giving a little of that away. 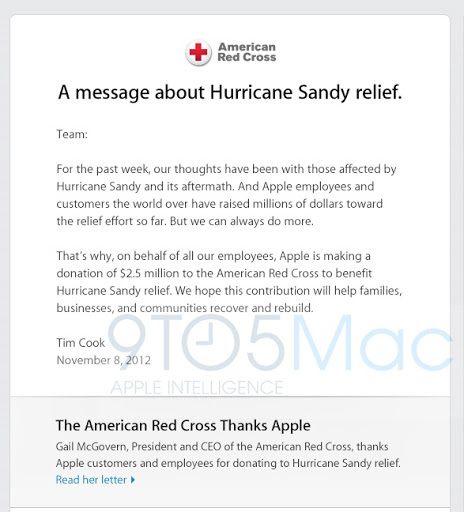 9to5mac intercepted an internal letter sent out to apple employee’s letting them know of the $2.5 the company planned to donate to the Red Cross. All of it meant to help those who suffered damage in the aftermath of hurristorm Sandy. 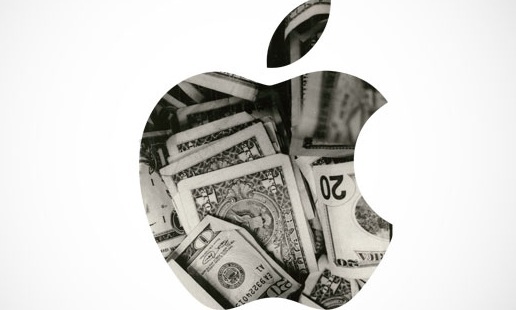 Guess this means we can cut Apple some slack for that whole foxxcon thing, right? Just sayin’: Never forget. UPDATE: Should New York City Be Having A Stupid Marathon? New York City is slowly getting back on its feet after, nearly, a full week of dealing with the aftermath of the storm. So you would think that now wouldn’t be the time to have a huge Marathon that would divert man power away from the clean-up and recovery effort, right? Wrong, stupid! However, Unlike Mayor Bloomberg, some people don’t think it’s a good idea to go forward with the ING Marathon (but the runners practiced really hard!). But the $340 million the Marathon usually brings into the city doesn’t hurt either. And Marathon organizers say they’ll be raising money for a recovery fund. So there’s that. People in Staten Island, who feel over looked in the post Sandy aftermath, seem particularly upset at the news the event will still happen – the course runs through Staten Island, to Brooklyn, Queens, Manhattan and the Bronx. Their anger seems warranted as thousands are still with out power and in need of food and water throughout the area. This might even be enough to make them want to succeed from the city. So even though the decision has already been made, is it really a good idea for the city to host the marathon at a time like this? UPDATE: The Mayor has come to his senses and canceled the Marathon. The pressure was really starting to build for Bloomberg. Critics were starting to wonder why he decided to hold it so soon after the storm, and were increasingly getting more vocal. So late today, news came down it’s donzzo. “The marathon has always brought our city together and inspired us with stories of courage and determination. We would not want a cloud to hang over the race or its participants, and so we have decided to cancel it. We cannot allow a controversy over an athletic event – even one as meaningful as this – to distract attention away from all the critically important work that is being done to recover from the storm and get our city back on track”.